Grania found this video and commented that it was “genuinely funny”. (I think she was referring to the repartee in the last three minutes.) To a Chicagoan like me, though, it’s deadly serious. I prefer deep-dish (or stuffed) pizza over New Yorkian cheese-covered cardboard. I do like the New York style, but given a choice I’ll always go for the thicker ones. In the video below we see a deep-dish pizza. The “stuffed” pizza is like that, but has a bit thinner crust and a crust on the top as well, so it’s a real pizza “pie”. Here’s a stuffed pizza from Giordano’s of Chicago. I like mine with homemade sausage, garlic, onions, mushrooms, and green peppers. That stuffed pizza is my favorite of all. But is it “pizza”? Who cares? It’s GOOD! Arguing about whether this is pizza is like arguing whether compatibilist free will is really “free will”. The question is semantic, and arguing about it fruitless. What matters is whether, when you crave a baked comestible of dough, tomatoes, and cheese, which concoction will fill the bill. I’ve already answered that for myself. Here’s the YouTube notes, and I’ll add that I spurn “Chicago pizza” in any city other than Chicago, as those foreign pizzas are invariably inferior simulacra of the real thing. This entry was written by whyevolutionistrue and posted on March 16, 2019 at 3:00 pm and filed under Chicago, Chicago!, food. Bookmark the permalink. Follow any comments here with the RSS feed for this post. Post a comment or leave a trackback: Trackback URL. Looking at the photo, I would say that the object being served up has two separate layers of dough with cheese in between. That means it is topologically not the same as a normal pizza and perhaps deserves a different name. Having said that, one of my favourite kinds of pizza is calzone which is topologically identical to a Chicago pizza although all of the “topping” is on the inside. Deep dish “pizza” isn’t pizza, it’s a casserole. It’s really funny but he’s dead wrong–also about the hot dogs! So I’ll just agree with you on the dogs. So true. His best point: the pizza in NY is just called “pizza” all across the US (and most other parts of the world). The abomination you find in Chicago is called “Chicago-style pizza.” It’s not pizza, it’s just some weird thing sold (invented?) in Chicago that they call pizza. Man, remember when The Daily Show was funny? Those were the days. The days when political comedy both made you laugh and made a point. Now, the show is just a clap-along, where you clap if you agree that Donald Trump/Republicans are bad every time they make an incredibly obvious and almost invariably unfunny “joke” or lame attempt at an impression. It seems like so much comedy has become less about laughing and more about cheering in agreement. Oh man, you are so right about The Daily Show losing its magic. I use to watch it and laugh out loud every time. Now it’s a cringe inducing chore to watch. I stopped watching shortly after Jon Stewart left and haven’t watched it in years. The above clip about pizza is a great example. Trevor Noah could never pull that off. I miss The Colbert Report too. Imagine the hilarity that could be had with Stephen Colbert and Jon Stewart, in their prime, doing those shows now in this awful era of The Embarrassment in Chief, Donald Trump. Same here. I feel kind of bad for Trevor Noah but not bad enough to watch. For me thickness doesn’t matter, it’s all PIZZA. Without anchovies though it’s an inferior, lower case pizza. Also pineapple in the same room as a PIZZA is a crime. I’m with you on the anchovies…yumz. Just don’t mix anchovies with pineapple- now that would be a crime. Pizza is cooked on a flat surface. If it’s cooked in a pan, it’s a casserole. Somehow I’ve managed to get this far without ever consuming a Chicago-style deep-dish pizza. But this: early on, a comment is made that New York-style pizza is too dry, like cheese and sauce on a paper plate. Or something. That hasn’t been my experience. I’ve had pizzas in New York (growing up in CT), and true, while it wasn’t overly thick, it certainly wan’t dry. In fact, it was beyond wet–it was soupy. Horrid. If I wanted tomato soup, I would have ordered tomato soup. And I agree with Michael Fisher about the anchovies (although not necessarily the pineapple). Without anchovies, it may be a pizza, but it ain’t worth eating. The essential ingredients in pizza are the crust and some form of cheese. The rest is due to the chef’s creativity. I’ve had pizzas in India (Varanasi) that had those two ingredients plus vegetables and they were delicious, the crust nice and crispy. Seems to me the Chicago thing would be soft and doughy. Isn’t that so? I once had pizza from Pizza Hut which had been cooked in a pan. Absolutely indigestible! That said, I will to try a deep-dish one if I ever get to Chicago again. Is Chicago deep-dish really “pizza”? I don’t think it’s fair to talk about NY pizza as “cardboard”. Obviously, that’s just bad pizza. There is a lot of bad pizza out there, regardless of the variety. Once you have had the good stuff, it is hard to tolerate the mediocre and bad. I recently had what was called “Detroit pizza”. It was quite thick but not as thick as Chicago stuffed pizza. It was cooked in a rectangular pan such that the cheese that meets the edge is made crispy. It was only ok, not great. I was not in Detroit so someone from that area will undoubtedly declare that what I had wasn’t the “real thing”. Perhaps so. Finally, many years ago some friends of mine and I were talking about pizza. One of us asked if anyone had tried Chicago pizza. Upon hearing this, another one of us whipped a photo out of his wallet and said, “Do you mean like this?” Evidently he had been trying to recreate Chicago pizza at home. We all thought it was just plain weird to have a picture of a pizza in one’s wallet and told him so. We told him he was weird but in a nice way. The man had talents. He could mimic sounds from old-time arcade games incredibly well. When he first did it, I expected he was using some kind of electronic device. He reveled in his weirdness. Sounds like someone I’d get along with well! Well, now I’m hungry despite having eaten my (comparatively meager) lunch sandwich. I’m with those who don’t find height to be disqualifying. If it tastes like pizza, looks like pizza and is made with crust, sauce, cheese and toppings, I say it is a pizza. Do Chicago pizza vendors deliver in 30 min to rural western Canada? Need a sample size of at least thirty two vendors to get statistically valid answer. Here in France (Sud Est), I love making Pizza and I always make a Sicilian, a thick based Pizza with sauce tomate, Corsican sheep’s cheese and Anchovies. It goes down a treat with my family. My other favourite is Focaccio. Not to mention those other local specialities – Pissaladière, Socca and salade Niçoise. Music to my ears…and happiness to my taste buds. Just make sure the tuna is extra special. I like Ortiz brand from Spain. Well…all you chaps seem to agree that ‘Merican pizzas are the bees’ knees, no matter where in the US they come from. If I want a pie, I’ll have a Cornish pasty. My stepmother is from Milan and super Italo-centric, but she admits New York pizza is better than Italian pizza. The best pizza I ever had was in Naples. Very thin, crisp crust, covered with ultra-fresh tomato sauce (I could taste the tomatoes) and superb, luscious mozzarella. It made America pizzas, even the good ones, look like stale discs made from over-processed ingredients. My Neapolitan pizza felt like the essence of a pizza. I had the opposite experience there. I spent about three weeks in Naples, and every pizza place that was recommended to me was just awful. I remember one pizza that looked good at a distance, but what looked like pepperoni turned out to be thick tomato slices. And there was nowhere near enough cheese. I have no doubt that there is and was great pizza there, but I never found it. I ended up eating a lot of Chinese food, but I was there as a student with limited resources anyway. I’d suggest you thought it awful because it wasn’t what you expected (i.e. a USA derivative style) instead it was a real pizza. Italian pizza is the best in the world. And Amalfi Coast pizza is the best in Italy. South Italy is home of pizza. You’ve probably never had an authentic Italian pizza. Real Italian pizza is basically bread with a thin layer of tomato sauce. The pizza you have had owes its existence as much to the American improvements as the original Italian dish. Whilst I agree with you on the toppings (more than five including cheese and tomato sauce is too many and pineapple is always an abomination), the best pizzas I have had have been in France. Well, I have had quite a number of pizzas in Italy, and I just don’t agree with your assertion. The last one was in the back streets of Modena (not Naples, I accept), and the boss had barely heard of the US, let alone nicked its recipes. That’s the reason why I said you have probably never eaten an authentic pizza. You won’t get them in restaurants. My source is the Italian couple that maintained my parents’ house on the Amalfi coast. I always remember my late father, who was stationed in Italy with the British Army for a year or two during WWII, telling me about pizza in Italy. He said that it was just something that Italian families did with leftovers: put them on bread dough with some tomato sauce and cheese and bake. Although my father was pretty much the opposite of a gourmet, this story has a just-so ring-of-truth quality to it. Of course, this would parallel how many food preparations get started. Somebody makes something out of ingredients on hand and then it gets elaborated and refined by others. That’s very similar to what my parents were told. Incidentally, my grandfather was in Italy with the RAF during the war. He was actually an administrator and the (possibly apocryphal) story is that he effectively ran southern Italy. I thought the Mafia ran southern Italy. My father was a mechanic in the Eighth Army. As his grand child I was allowed to call him “Grandad”. Everybody else had to call him “Il Capo” for some reason. I just meant to add that this is a trivial thing to get aerated about, so let’s just agree to disagree. I wasn’t under the impression that we were really disagreeing about anything. I was just relating a pizza origin story. I find it interesting that, with a lot of foods, the origin is not always as simple as you might think. The Italians and others in southern Europe culturally appropriated tomatoes from the Aztecs and other native Nations, along with maize (so-called “corn”) and potatoes. We have to get Titania on this. 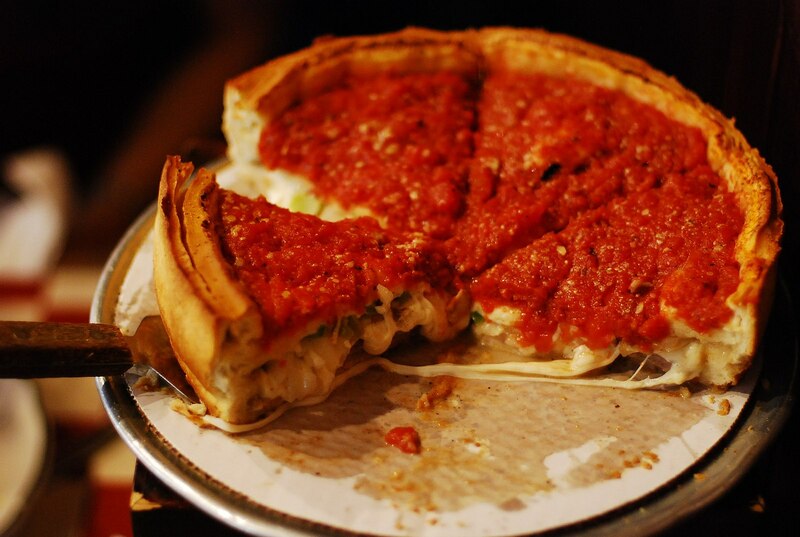 A Chicago deep-dish by any other name would taste as good. Anything that is designed has a degree of Freedom, and that especially goes for good pizza of any variety! It may identify as pizza. And I thought wine snobs were difficult and opinionated. My mind has been broadened. I don’t argue about Pizza, I just eat it. So does everyone, at least among lactose-tolerant populations. And loving it. The phenomenal rise in pizza consumption over the past century is a story all in itself. Are we set up to argue against the local food being popular among the locals? I pass … and I would probably pass on tomato casserole type dishes too, which it sounds like people agree this is. What is amazing is how successful pizza is in its great variety of forms. There are the ‘culturally appropriated pizzas’ like Thai pizza, Mexican pizza, and so on. Pizza breaks all cultural barriers, and unites humanity into one big happy family. Clearly, I have a great deal of respect for pizza. I like thin crust. My pizza dough is nearly a liquid state so that it can be that thin. One of the benefits being, you don’t have to wait for it to rise. It’s already risen enough once you get done fiddling around with the cheese and pepperoni and whatnot. Fastest pizza in the West. Believe it or not, mustard pizza is quite good. I wouldn’t have thought so but it was something new and something familiar at the same time. Wonderful. As far as ‘New York’ style pizza, the best I had Trattoria Belle Gente in Verona NJ, with chopped tomatoes and fresh basil. Mustard pizza? What the hell is that. I love mustard, so might like it. Just can’t grok it. I actually had some really good Chicago style pizza in Playa del Carmen Mexico of all places. It wasn’t quite Lou Malnatis or Gino’s level good, but as close as I’ve ever had. I was thoroughly confused as to how such a place ended up there considering I haven’t found any decent Chicago style in the states outside Chicago. My definition of pizza is something that has a crust, sauce, and cheese. Preferably delicious, but most turn out to be anyway. Chicago pizza is basically quiche but with tomatoes instead of eggs. I’m going to hell in so many people’s food dogma. But I’ll be well fed. All pizza is good pizza, though some is better than others. One of the very best is any Japanese pizza with ika-no-shiokara (salted squid guts). It’s like anchovies taken to the next level. ika-no-shiokara with rice is lovely. I can’t imagine what it’s like as a topping on a tomato & cheese pizza. A must try! The quiche-like dish is not what would be considered pizza in most parts of the world where they do have pizza. Since ‘pizza’ can mean pie as well as a small flat bread, I do not think we can decide either way on etymology. One could say that the adjective ‘Chicago’ pizza is sufficient to distinguish it from what the rest of the civilised world considers a pizza to be. Anybody else got that going round their head at the moment? So long as I like it, for all I care you can call my favorite pizza “pudding” (or, for that matter, my favorite pudding “pizza”). And while there are many styles I like, I am partial to Old Forge, PA white. These, of course, must always be referred to as prepared as “trays” — not “pies” — with individual “cuts” — not “slices”. I guess I figure some term are inviolable, after all. Well in the UK attempts have been made to introduce deep-pan pizza, but it is really a contradiction in terms. Either you have pizza……toppings on a THIN crust, or you have QUICHE!! I’m sorry but it’s not quiche without eggs. Yes, I know there are pizzas with a fried egg or two these days but they’re still not quiche. I have the same attitude to “authentic”. I really don’t care whether or not something is “authentic” but rather whether it is tasty, affordable (relative to my budget at the time), safe, etc. On the other hand, obvious “unauthentic” things should probably not be *marketed* as the opposite. But that’s vague. Also, what’s the dividing line between pizza and flatbread with cheese? I prefer an unleavened, thin pizza base so that it’s everything else that does the singing & dancing on the taste & nose buds. The cheese. If you put Italian cheese on flatbread, it’s pizza. If you put Swiss cheese on flatbread, it’s not pizza. C’mon…we all know that the only *authentic* pizza is made with salted orc guts. And slow-baked in Mordor’s only diesel-fired pizza oven.